Zoncasino focuses on providing a wide range of games and promotional deals. The website guarantees that the players will only be presented with the hottest games on the online casino market. The fact that the website features the latest NetEnt games make the guarantee more believable, since this software provider is known for its excellent track record. The animations in the games are developed with tremendous care. Furthermore, the nice design of Zoncasino's main page makes the players more willing to stick with the venue. An extremely good loyalty program is also responsible for the high commitment levels among players. Loyalty points are collected with each bet and contribute towards prizes at the loyaltyshop. In fact, it isn't just the bonus prizes that can be redeemed. There is also the possibility of picking up physical prizes such as; Ipads or television sets. New players can always count on a deposit bonus. At this casino, a 100% Zoncasino bonus deal is offered up to €250 on the first deposit. Twenty-five spins are also provided with the deal. It is important to point out that the loyalty program differs from the VIP program. In the case of the latter, the casino has some incredible VIP benefits. They are typically awarded when the players appear on the top wagering list. Specific casino games also have promotions attached to them. Two hundred free spins can be received with the live circus roulette. The daily deals change with the appearance of new seasons. Special New Year deals can be expected in January. Furthermore, the website has enabled easy deposits. Such deposits can be made using the following services; Visa, MasterCard, Maestro, Skrill and PaySafeCard. The casino has a policy dealing with the player's access to the casino content. According to the policy, the players from the following locations are prohibited from opening a real money account; United States, Israel, Turkey and Mauritius. Unfortunately, the casino has experienced credit card fraud. As a result, the amount that is paid out will equal the amount that is purchased in the case of players from these locations; Albania, Armenia, Azerbaijan, Belarus, Bosnia and Herzegovina, Bulgaria, Croatia, Czech Republic, Estonia, France, Hungary, Indonesia, Italy, Turkey, Russia, Serbia, Slovakia, Slovenia, and a number of other countries. The casino opted for the Euro currency, which indicates the willingness to receive players from the continent and beyond. The newest games have been highlighted as opposed to the most popular games. 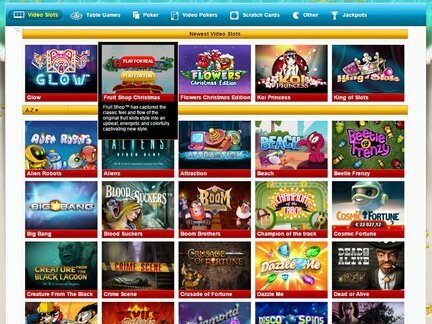 However, the interviews with the casino staff reveal that there is a pattern of high traffic when it comes to games that have also received good ratings on other casino sites. In terms of the highly promoted new games, a couple of titles deserve to be mentioned here; Alien Robots, Attraction, Boom Brothers, Cosmic Fortune, Dead or Alive, Dazzle Me, Elements, Egyptian Heroes, Geisha Wonders, Ghost Pirates, King of Slots, Jungle Games, Knockout, Koi Princess, Jack Hammer, Mystery Mansion, King of Slots, Piggy Riches, Retro Super 80's, The Wish Master, Thief, Troll, Wild Turkey, Wild Water, Wonky Wabbits, Twin Spin, Victorious, Tales of Krakow, Super Lucky Frog, Zombies, etc. The presence of NetEnt games and wonderful animations has led players to give a largely positive evaluation of the casino. No major complaints can be observed, although a few isolated voices of dissent can still be identified. Live help is available along with e-mail support. The latter method is inferior due to the prolonged waiting period for the reply (up to 24 hours on regular working days). The casino registration and approval is handled by the Government of the Dutch Antilles. This gambling license was achieved by Yellow Stone Entertainent N.V. The Curacao license is not on par with licenses from other casino regulating authories. It is simply a business license. It's value is diminished based on a poorly conducted licensing procedure. If I had to decide between this casino and the alternative web casinos with a license from Curacao, I would choose this venue. It has a very good promotinal deal package & loyalty program. All kinds of unique prizes can be achieved with the deals. Furthermore, the NetEnt (NetEntertainment) trademark is associated with quality gaming. I had a sense that the games on the site had been selected in such a way as to maximize the player's pleasure.